Rhabdomyosarcoma often poses difficulty in diagnosis, as it exhibits a spectrum of histologic appearance which includes embryonal, botryoid, spindle cell, alveolar and undifferentiated variants. In 1992, Cavazzana et al. in their study reported 21 embryonal rhabdomyosarcomas composed predominantly (>80%) of elongated spindle cells which mimicked the fetal myotubes, at the late stage of cellular differentiation. On immunohistochemistry and electron microscopy, the cells showed a high degree of skeletal muscle differentiation. The term spindle cell rhabdomyosarcoma was coined to distinguish this entity from the usual embryonal rhabdomyosarcoma due to its more favorable clinical course. This variant of rhabdomyosarcoma was first reported in adults by Rubin et al. These adult-type spindle cell lesions have several distinctive features, including a predilection for the head-and-neck region, a greater degree of cytologic atypia in the spindled cells, focal areas resembling pseudovascular sclerosing rhabdomyosarcoma and a more aggressive clinical course than pediatric lesions. Herewith, we report a rare case of spindle cell rhabdomyosarcoma of mandibular gingiva in a 52-year-old male. A 52-year-old male patient reported to the Department of Oral Pathology and Microbiology, with the chief complaint of growth in the left lower back region of jaw for the past 4 months. The patient gave the history of caries in 36 which led to the fracture of crown 8 months back. He had habit of gutkha chewing 2–3 times a day and alcohol intake for 20 years. On extra-oral examination, a diffuse swelling was noticed, [Figure 1]a extending anteroposteriorly from corner of the mouth to 1 cm anterior to the angle of the mandible and superoinferiorly from the corner of the mouth to the inferior border of the mandible. 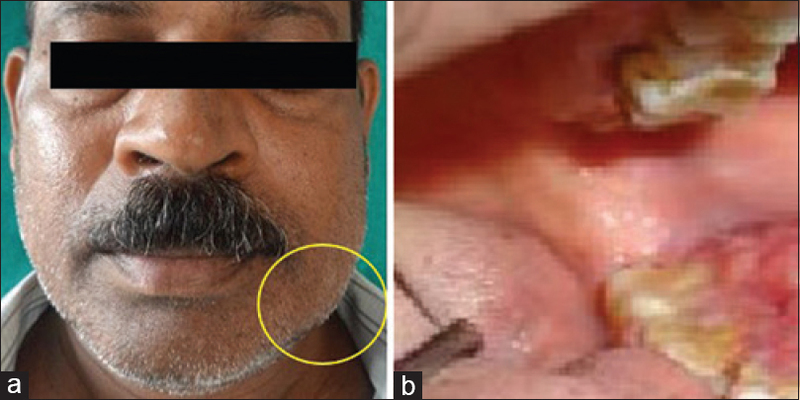 The left submandibular lymph node was palpable, mobile and nontender. Intraoral examination revealed an exophytic, lobulated, sessile growth on buccal gingiva [Figure 1]b measuring 4 cm × 2.5 cm extending from the left mandibular first molar to the distal of third molar, obliterating buccal vestibule. Expansion of buccal cortical plate was noticed. 37 and 38 showed Grade-1 mobility. Orthopantomogram revealed an irregular bone loss [Figure 2]a extending from 35 to 38 region. Root pieces of 36 and floating teeth appearance with 37 and 38 was noted. Cone beam computed tomography showed the destruction of both buccal and lingual cortical plates [Figure 2]b along with erosion of superior border of mandibular canal. Incisional biopsy was performed under local anesthesia after obtaining patient's written consent. The H and E stained section showed a highly cellular connective tissue stroma covered by parakeratotic stratified squamous epithelium. The connective tissue consisted of three types of cells as follows: (1) cells with vesicular nuclei (2) hyperchromatic spindle-shaped nuclei and (3) large polyhedral cells with hyperchromatic condensed nuclei at periphery [Figure 3]a. High power magnification view showed cellular and nuclear pleomorphism, nuclear hyperchromatism and abnormal mitotic figures [Figure 3]b.
Immunohistochemistry revealed focally positive cells for both cytokeratin and vimentin in the connective tissue. Based on the above findings, a diagnosis of spindle cell variant of squamous cell carcinoma was given. The patient was then referred to the higher center for further treatment. Positron emission tomography scan was performed to rule out any metastatic foci. Left hemimandibulectomy with radical neck dissection was done and the excised mass was sent for histopathological evaluation. The H and E stained section of excisional biopsy showed highly cellular connective tissue stroma composed of elongated spindle-shaped cells with hyperchromatic nuclei, arranged in fascicles [Figure 4]a. Marked cellular and nuclear pleomorphism were noted [Figure 4]b. Numerous large eosinophilic cells with vesicular nuclei and prominent nucleoli resembling rhabdomyoblast were also noted. The overlying stratified squamous epithelium, however, did not show any dysplasia. Further immunohistochemistry was performed, tumor was strongly and diffusely positive for desmin [Figure 4]c; diffusely and focally positive for MyoD1 and myogenin [Figure 4]d and [Figure 4]e; Tumor also showed weak positivity for AE1/AE3 [Figure 4]f; while negativity for CK5/6, P63 [Figure 4]g; S100 and SMA. Based on the above findings, the diagnosis of spindle cell rhabdomyosarcoma was given. The patient is subjected to chemotherapy for the past 1 year and postoperative follow-up did not reveal any recurrence. Rhabdomyosarcoma was initially described by Weber in 1854 in a tongue lesion, but first documentation was published by Arthur Purdy Stout in 1946. Horn and Enterline devised the first classification scheme in 1958, based on the clinical and pathologic features of these tumors. This scheme, also known as the “conventional scheme,” recognized embryonal, botryoid, alveolar and pleomorphic subtypes. From 1987 to 1991, the Intergroup Rhabdomyosarcoma Studies (now recognized as the Soft Tissue Sarcoma Committee of the Children's Oncology Group) conducted a comparative study of the various classification systems for rhabdomyosarcoma. Based on the reproducibility and prognostic significance of each of these systems, this group proposed a classification scheme, known as the International Classification of Rhabdomyosarcoma. According to this classification, our case can be placed as a spindle cell RMS having superior prognosis than the embryonal RMS. Histopathology of RMS is analogous to myogenesis in the developing embryo, yielding clues to the biology of these lesions. As the skeletal muscle fibers are permanent cells that do not divide after birth, it is unlikely for rhabdomyosarcoma to arise from skeletal muscle fibers themselves. Thus, RMS is considered as a tumor derived from primitive mesenchyme, exhibiting a profound tendency toward myogenesis. Each of the rhabdomyosarcoma subtypes occur in a characteristic age group. The embryonal type presents the subtypes including classic, spindle cell and botryoid and is the most common variant, occurring in children between birth to 15 years of age. However, our case was reported in a 52-year-old male patient, which falls in the rare age group. The embryonal RMS contains a mixture of spindle and undifferentiated round cells and immature striated muscle-like cells (rhabdomyoblasts) with abundant eosinophilic cytoplasm either tightly or loosely packed in a myxoid stroma. The botryoid tumor is named so because of gross resemblance to cluster of grapes. Histologically, a multilayered band of cells just below the surface epithelium called the cambium layer is a special finding of this variant. The alveolar type presents in the older children (10–25 years old) and contains clusters of small round cells with hyperchromatic nuclei and eosinophilic cytoplasm separated by fibrovascular septa. Pleomorphic type occurs in older people between the age group of 50–60 years and is characterized histologically by large bizarre cells of racquet, strap, ribbon and spindle types in a haphazard arrangement. Spindle cell rhabdomyosarcoma is composed of almost exclusively of elongated fusiform cells with cigar-shaped nuclei and prominent nucleoli. The tumor cells have eosinophilic fibrillar cytoplasm with distinct cellular borders, closely resembling late-stage fetal myoblasts. Cytoplasmic cross-striations may be observed. The collagen-rich form is characterized by spindle cells separated by abundant collagen fibers arranged in a storiform or whorled growth pattern. The collagen-poor form is a more cellular proliferation of cells arranged in bundles, or fascicles, reminiscent of fibrosarcoma, (as seen in our case). Males are affected more commonly than females by a ratio of approximately 1.5:1, but the male predominance is less pronounced during adolescence and young adulthood. The presenting signs and symptoms of RMS are variable and are influenced by the site of origin, the age of the patient and the presence or absence of distant metastases. In affected patients, the tumor expands and infiltrates the muscle from which it arises, presenting first as a well demarcated nodule or polypoid lesion with a soft or gummy consistency. Patient in the present case, presented with lobulated, painless growth on the buccal gingiva. A site predilection within oral regions has not been well established; some authors have stated that the tongue is the most common site. As rhabdomyosarcoma is considered to be derived from primitive mesenchymal cells,, it has been reported in areas where the striated muscle is absent such as the common bile duct or the urinary bladder and may be the gingiva in the oral cavity. Furthermore, a case of multifocal RMS occurring in bone marrow has been reported, which suggests the pluripotentiality of this tissue. Although mandibular lesions are rare, our case and the documentations in the literature suggest that rhabdomyosarcoma should be considered in differential diagnosis. Inadequately treated tumors grow in an infiltrative, destructive manner and recur in a high percentage of cases. Bone does not constitute an effective barrier to the growth of the tumor, and bone invasion is a frequent finding, particularly with RMS in the head-and-neck region. Metastases develop during the disease and are present at the time of diagnosis in about 20% of cases. Major metastatic sites include the lung, lymph nodes and bone marrow. However, the present case showed only regional lymph node metastasis. Since the early 1960s, overall 5-year survival rate of patients with rhabdomyosarcoma increased from 25% to 73% due to a multidisciplinary therapeutic approach that consists of surgical removal of the neoplasm and multi-agent chemotherapy with or without radiotherapy. The ubiquitous distribution and diverse histologic pattern of RMS possess a challenge to the diagnosis; judicious use of immunohistochemical markers may help in diagnosis by ruling out other differential diagnosis. RMS is a rare disease in adulthood and therefore, the clinic-pathological characteristics, natural history and treatment options are not as well established in this population. However, recognition of the correct diagnosis and histological subtype of RMS is of critical importance in the treatment and prognosis of this disease. Hartmann S, Lessner G, Mentzel T, Kubler AC, Richter DM. An adult spindle cell rhabdomyosarcoma in the head and neck region with long term survival: A case report. J Med Case Rep 2014;8:208-13. Arul AS, Verma S, Arul AS, Verma R. Oral rhabdomyosarcoma-embryonal subtype in an adult: A rarity. J Nat Sci Biol Med 2014;5:222-5. Ram H, Gupta S, Mohammad S, Chandra A. Aggressive rhabdomyosarcoma of palate: A case report and literature review. J Orofac Sci 2014;6:137-40. Muala HA, Alaboudy A. Embryonic rhabdomyosarcoma case report and literature review. Internet J Head Neck Surg 2009;4:1-5. Arya K, Vij H, Vij R, Rao NN. Rhabdomyosarcoma of mandible: A diagnostic predicament. J Oral Maxillofac Pathol 2011;15:320-5. Goldblum JR, Weiss SW, Folpe AL, editors. Rhabdomyosarcoma. In: Enzinger and Weiss's Soft Tissue Tumors. 6th ed. Philadelphia: Elsevier India Pvt. Ltd.; 2014. p. 601-38. Rajasekhar G, Vura N, Kant S, Dhanala S, Srikanth D. Rhabdomyosarcoma – Report of two cases and review. Int J Clin Dent Sci 2011;2:16-20. Cobanoglu B, Simsek M, Senol S. Rhabdomyosarcoma of the upper lip in an adult patient. Case Rep Med 2015;2015:508051. Sudhakar S, Geethika V, Rao N, Smitha B, Kiran ChS. Alveolar rhabdomyosarcoma on the left maxillary alveolus: A unique presentation. J Clin Diagn Res 2015;9:ZD07-9. Parviz D, Saeideh K. Oral rhabdomyosarcoma: A case report. J Clin Exp Pathol 2014;4:1-4. Peters E, Cohen M, Altini M, Murray J. Rhabdomyosarcoma of the oral and paraoral region. Cancer 1989;63:963-6. Wenig BM, Pilch BZ. Tumors of upper respiratory tract. In: Fletcher CD, editor. Textbook of Diagnostic Histopathology of Tumors. 2nd ed. London: Churchill Livingstone; 2001. p. 123-4.